Special Statement: On August 1, 2018, The Chronicle of Higher Education reported allegations of sexual misconduct against Michael Kimmel, a prominent sociologist featured in a number of MEF videos. We take allegations of sexual harassment and all forms of gender violence very seriously and will continue to closely monitor this situation. We will have further comment when we have more information. We've heard again and again that men and women are engaged in a "battle of the sexes," that we're so differently wired and so foreign to each other that we might as well come from different planets. 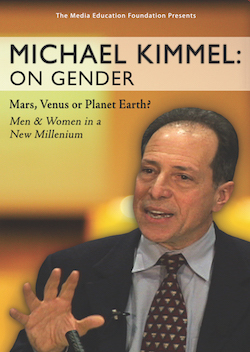 In this powerful new lecture, renowned speaker and bestselling author Michael Kimmel (The Gendered Society, Manhood in America) turns this conventional wisdom on its head. With clarity and humor, Kimmel moves beyond the popular inter-planetary notion that "men are from Mars and women are from Venus" to advance a decidedly more earth-bound and inter-connected view of the things men and women have in common. This is an accessible and entertaining introduction to gender politics and gender theory - as intellectually informative as it is inspiring, and suited for use across a range of disciplines and courses. "I've never seen such a large audience of students turn out for a speaker - and be so completely involved during the entire presentation." "Kimmel is one of the most renowned and respected researchers on men and masculinities in the world [and] has traveled widely as a speaker and lectured for students, professionals, and politicians in classrooms, in public spaces, and at conferences all over America. He has acquired a style and competence in performing for larger audiences, which is clearly visible in this documentary film. Kimmel is able to unite ethos, pathos, and logos in a refined way. The combination of self-confidence and rhetorical precision makes the film very useful for the classroom. ...The combination of the performance and the topics Kimmel talks about -- gender and sexuality -- makes it an exciting hour to watch."